Made some beef burger quite some time back. It was my first time making my own beef patties and quite surprisingly, it was very easy to make! Everyone loves it.. Adults.. Children... It was definitely a hit. :D It is also great for parties as well. Chop onions into small diced pieces. Tip the beef into a bowl with the onion and egg, then mix. The guide for eggs is about 1 egg to per pound of beef so that the patties will not crumble. Heat the pan to medium hot. Lightly brush 1 side of each burger with oil. Place the burgers, oil-side down, on the pan. Cook for 5 mins until the meat is lightly charred. Don't move them around or they may stick. Oil the other side, then turn over using tongs. Don't press down on the meat, as that will squeeze out the juices. Cook for 5 mins more for medium. If you like your burgers pink in the middle, cook 1 min less each side. For well done, cook 1 min more. Take the burgers off the pan. Leave to rest on a plate so that all the juices can settle inside. Slice each bun in half. You may pop your buns into the microwave or a minute or two for a sligthly crsipy bun. 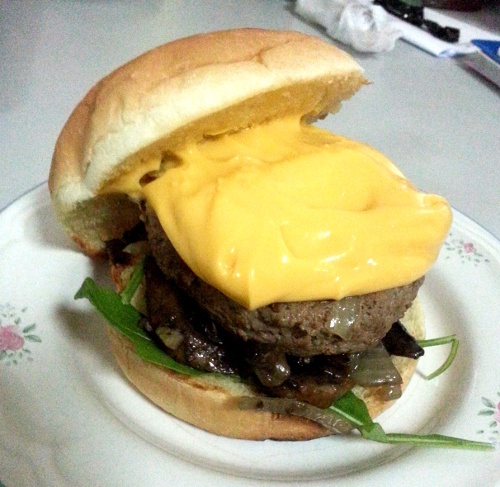 Depending on your preference, I like my beef burger with cheese and sauteed portobello mushroom. Totally in heaven!